The tea and wine we drink have something in common besides their deliciousness. Around the world, the soil in which grapes and tea plants grow is becoming eroded, impoverished of nutrients and contaminated by pesticides. Now an international team including Wilfrid Laurier University researchers is working on ways to remediate it. Laurier Biology Professor Frédérique Guinel and Brock University biologist Liette Vasseur recently received a $250,000 grant from the province’s Ontario-China Research and Innovation Fund to fund their research. The project involves researchers in tea-growing regions of China, three industrial partners in Canada, which are also funding part of the research, and a number of graduate students including Guinel’s Integrative Biology student Renée Christie. The industrial partners are Boreal Agrominerals, Mikro-Tek and Hughes Vineyards. Guinel and Christie’s role in the project is in part to reduce the use of chemical fertilizers. It’s an important goal because when chemical fertilizers leach out of the soil and into bodies of water, they can cause algal blooms. Algal blooms block light and deplete oxygen in the water, killing fish and other organisms. “Right now the organic farmers are convinced but we also need to convince the others and without science, we won’t be able to convince them,” says Guinel. Christie says researching alternative fertilizers was a major part of what attracted her to working with Guinel. “I could see the impacts of doing research in that area because not only do you protect the environment, there’s a human aspect, an aquatic aspect and benefits for the overall ecosystem,” she says. Specifically, Guinel and Christie are evaluating the use of an agromineral, Spanish River carbonatite, to enrich the soil. Quarried in Northern Ontario, the carbonatite is rich in calcium and other valuable minerals, including phosphorus, and can be used as a natural fertilizer on both organic and conventional farms. Carbonatite is found worldwide and can be used on a wide variety of crops. “If we can demonstrate that its use is beneficial to the soils, it could be part of the solution,” says Guinel. 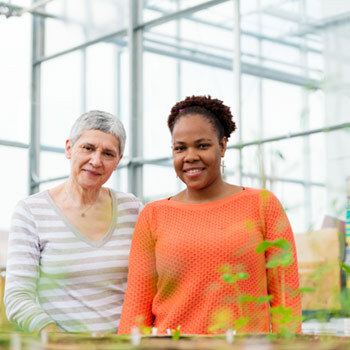 Guinel and Christie’s research also involves growing different combinations of plants and microorganisms in the greenhouse at Laurier’s Centre for Cold Regions and Water Science. Cover crops, such as alfalfa, chicory, red clover and oilseed radish, may be planted between principal crops, such as grapes or tea, to improve soil quality. As cover crops influence the microorganisms in the soil, the objective is to determine which ones, in what combination, are best to promote a healthy mix of beneficial microbes. Vasseur, the principal investigator on the project from Brock, is working on reducing pesticide use. “Chinese Oolong tea is still challenged by pesticide residues, raising concerns about health safety and limiting the potential export to foreign countries,” says Vasseur. Guinel and Christie say the wide collaboration – between faculty, students, universities, farmers, industry and countries – is a vital part of the project. Though she’s not sure yet whether she’ll pursue a PhD after her master’s or work in industry, Christie, who also works with Vasseur, does know she wants to continue working on soil and environmental issues.